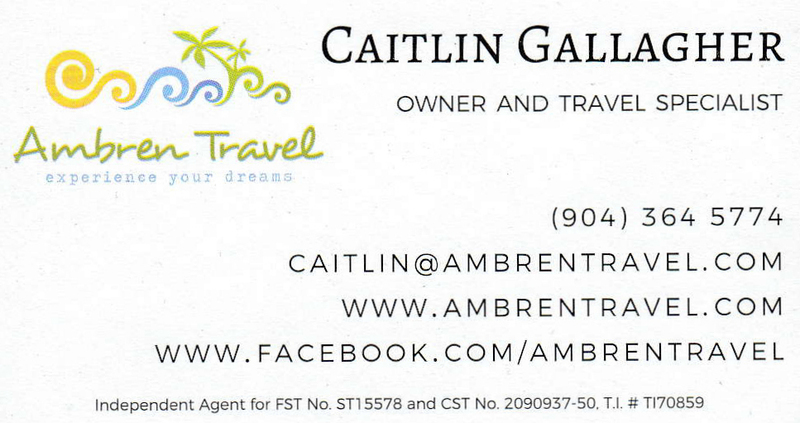 My wife and I sailed on the Carnival Inspiration in October of 2012. This was our 16th cruise with Carnival, but it had been a long time since we had been on one of the Fantasy-class ships... the smallest and oldest ships in the Carnival fleet. It was interesting to compare one of these smaller ships with the larger, newer ships we had sailed on recently... and to be reminded that there are some significant advantages to these smaller ships in the fleet. I'll be sharing with you a lot of pictures that I took onboard the Carnival Inspiration. Every picture on this page is my original photo... none are stock images or supplied by Carnival. Most of the photos were taken with my Canon Digital Rebel T2i camera. The main thing that jumped out at me right away when we got onboard the Carnival Inspiration was that it seemed less crowded than the other ships we had been on recently. The first afternoon of your cruise vacation can be a little intense because just about everybody firsts heads to the casual buffet restaurant on Lido deck for lunch. But on a ship with only 2000 passengers, it's not as bad as competing with 3700 other passengers like you do on the largest ships in Carnival's fleet. 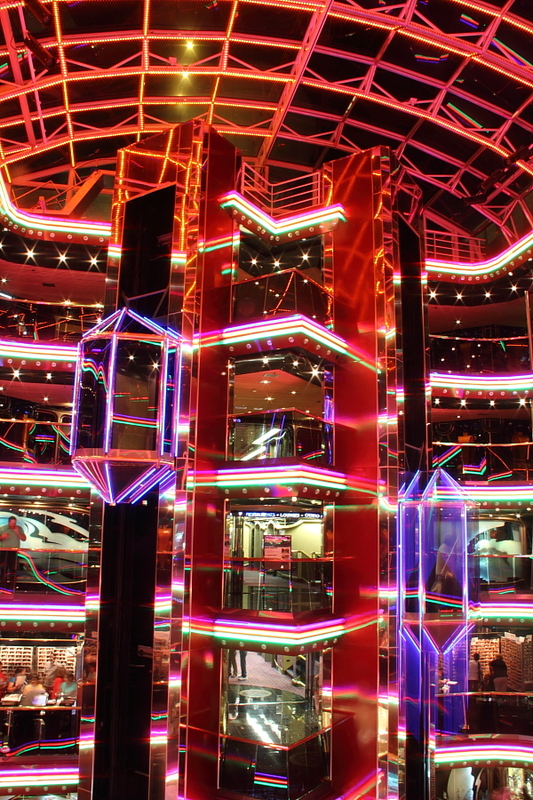 The Carnival Inspiration is one of eight Fantasy-class ships in the Carnival fleet. One of my favorite things about this class of ships is that the adults-only Serenity area is located in the rear of the ship, one deck below the Lido. This provides outstanding protection against the wind. Here's a picture of the Serenity area on the Carnival Inspiration, which shows how it sits down low in the back of the ship. The two decks above and in front of the Serenity area make an excellent wind block. In the photo, you can see part of the buffet restaurant through the glass. What you can't see is that tucked away under the restaurant is more of the Serenity area... offering seating in the shade of the deck above... and outstanding protection from any wind. Also, notice the thick cushions on the loungers in the Serenity area. These loungers are way more comfortable than your average outdoor chaise lounge, thanks to those thick cushions. The scope of this photo only shows a portion of the Serenity area... there's more out of view, including a second Jacuzzi. In addition to wind protection, having the Serenity retreat located in the back of the ship offers another great benefit... it's completely isolated from the noise of the main Lido swimming pool area. Between all the happy noises kids make in the swimming pool, the music from the poolside reggae band, and the poolside events such as the hairy chest competition... the main Lido pool can be a noisy place. Not at all serene! 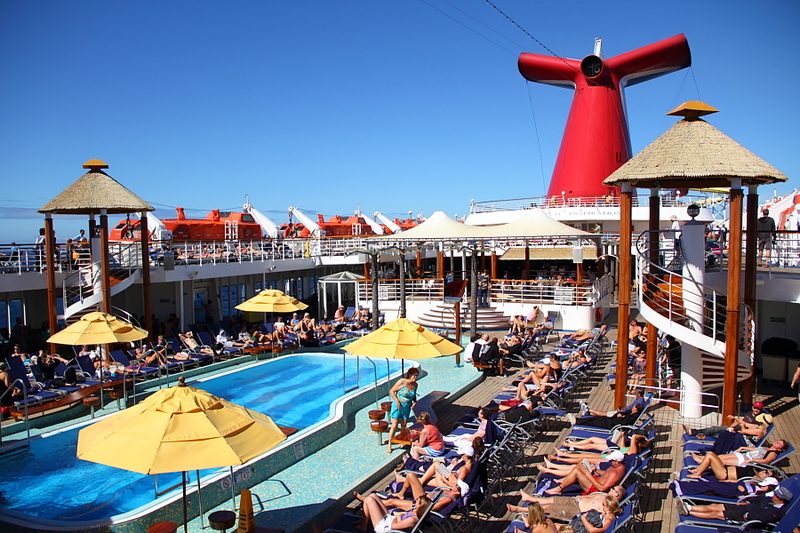 Unfortunately, on most Carnival ships, the Serenity retreat is located quite near the main pool... and noise from the pool area can and does disturb the serenity that's supposed to exist on the Serenity deck. But on the Fantasy class ships, with the Serenity area located far away from the main pool, it really is serene just like you'd expect it to be. Another thing I like about the Serenity area on the Carnival Inspiration... compared to the Serenity retreats on the newer, larger ships... is that there isn't a bar there. There's nothing like a bunch of drunk people having a party at the bar to disturb the serenity. That's been a problem for me when I've been trying to relax on some of the other ships in the Carnival fleet. So, I think it's a benefit that the Carnival Inspiration doesn't have a bar built in to the Serenity retreat. One thing that really impressed me on our cruise aboard the Carnival Inspiration was the 2-man reggae band that plays on that stage by the pool. I have to admit that I've never really been a fan of the reggae bands on Carnival ships... but the guys on the Carnival Inspiration were really great! It was the most mellow reggae band I've ever heard. I really wish I had gotten one of their performances on video so you could have heard how their style differed from the normal poolside reggae band. Instead of trying to be hip and cool and doing a bunch of Bob Marley songs, they did a lot of old 70's stuff and infused it with their own unique (and very mellow) style. I liked it a lot, and that's about the only reggae band I ever remember enjoying on a Carnival cruise. Normally, it's just way too rowdy and way too loud for me. This music was relaxing, but at the same time it was still "fun". 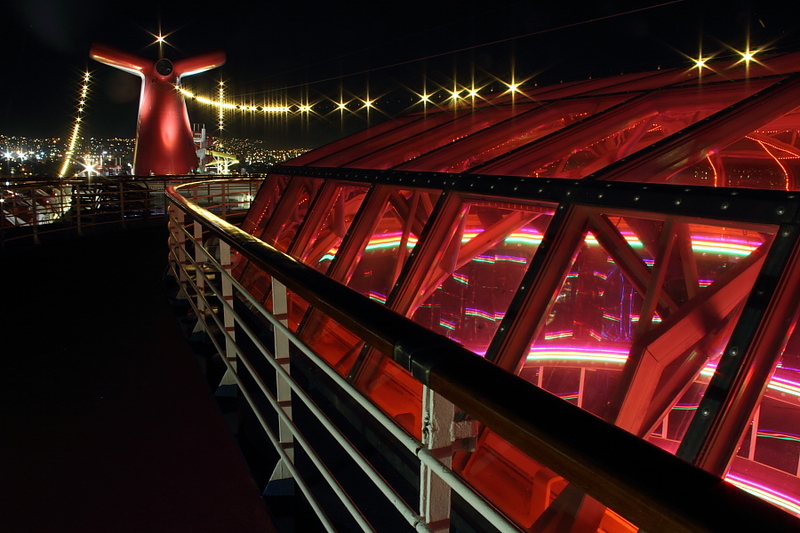 You may be wondering what the secret is to getting these beautiful night shots of the ship. I bet if you try to get shots like these with your camera, they won't look as good! 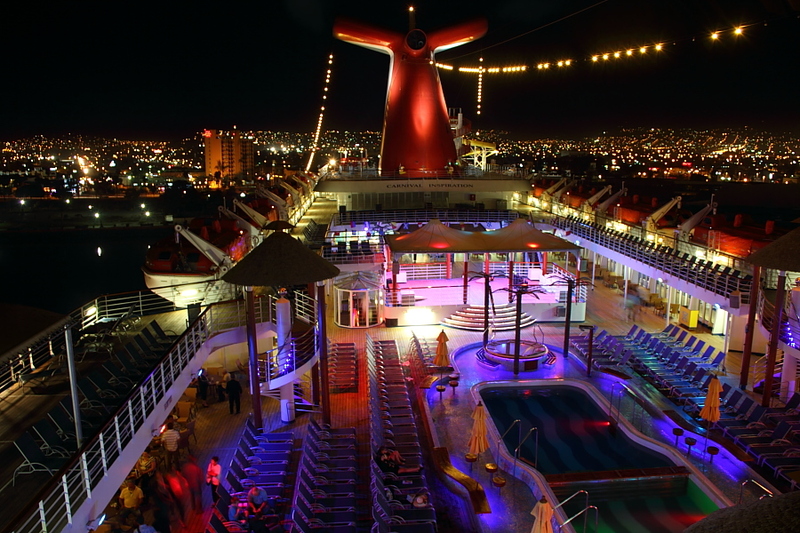 My secret for good cruise ship night shots is to bring a tripod with me. I put a luggage tag on it, and check it just like you would a suitcase... so it's really not at all inconvenient to bring aboard with me. With the camera sitting securely on a tripod, I can take long exposure shots at night... sometimes with exposure times as long as 30 seconds... to maximize the lighting in very dark conditions. You can see the results are pretty good! 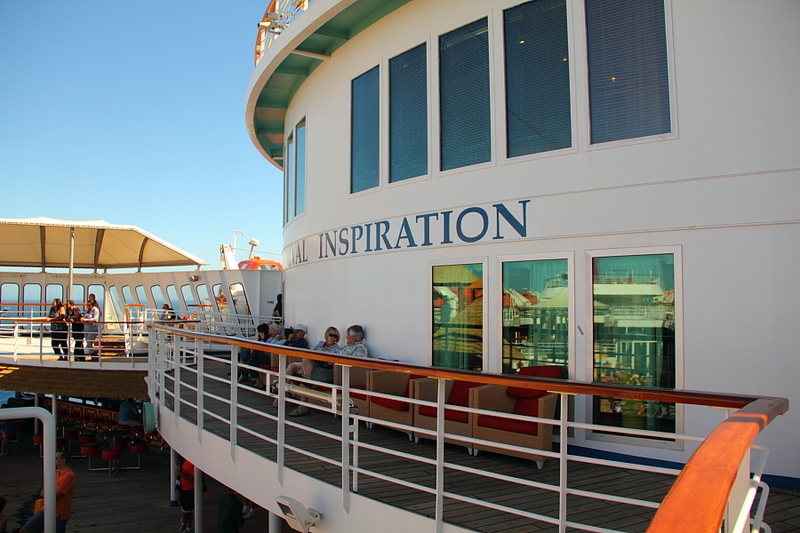 We had a favorite little spot to sit overlooking the Lido deck. There was a row of nice comfortable chairs on Verandah deck, and they had big soft red cushions. Very comfy! We spent some time here one morning when it was in the sun and it was one of the warmer spots on the ship... and again one very warm afternoon when these chairs were in the shade. One of the things I find fascinating about the owner's suites (there are two of them) on the Fantasy-class ships is that you can't just go to Carnival.com and book one like you would any other cabin onboard. The owner's suites are by invitation only! 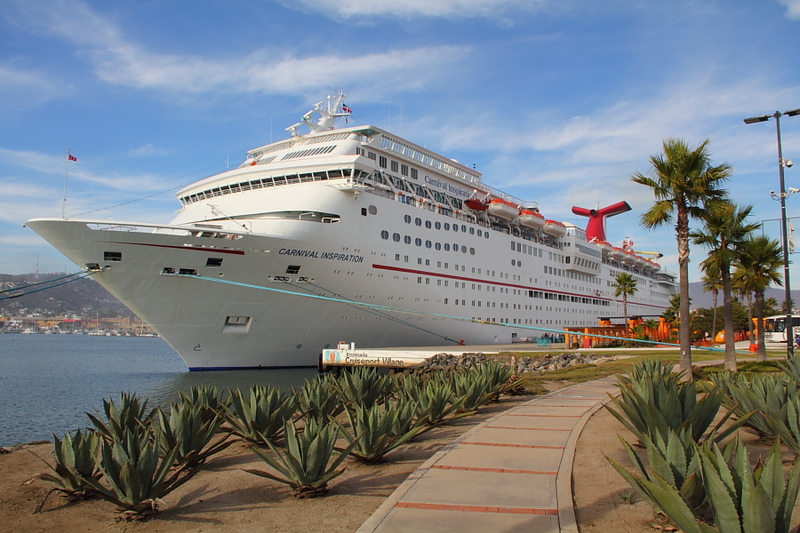 If no dignitary from Carnival Cruise Lines has the owner's suite booked up, Carnival will call someone booked in a regular cabin and ask them if they're interested in upgrading. (For a substantial extra cost, of course.) This is known as getting a call from "the upgrade fairy". I've never had that experience... but maybe if I keep cruising enough with Carnival, it will happen someday! If you're fascinated by the idea of the owner's suite, you'd probably enjoy reading my review of our cruise on the Carnival Sunshine in 2013, where we stayed in the Captain's Suite! Our 4-day cruise on the Carnival Inspiration visited the city of Ensenada in Mexico, and the city of Avalon on Catalina island off the coast of southern California. The main reason I wanted to go on this particular cruise was to visit Avalon. 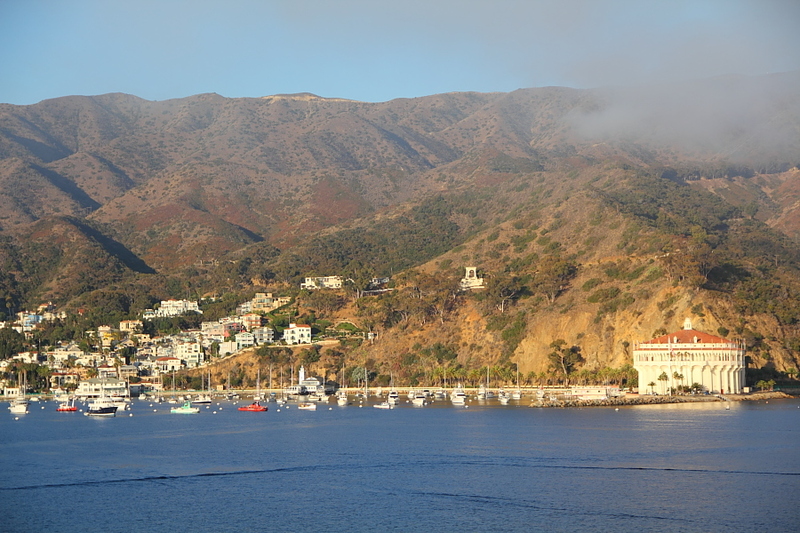 I've lived in California for over 50 years, but I've never been to Catalina island. So, I figured it was time to cross this one off my bucket list. Here's a shot I took of Avalon, from the deck of the Carnival Inspiration. The morning fog hadn't completely burned off yet. That round building on the right is known as the Avalon casino... altough it's never been a place of gambling. The word casino had a slightly different meaning back in the 1920's when this building was constructed. In those days, the word casino meant a gathering place. I had seen a documentary on PBS about the Avalon casino, and it looked so interesting that I wanted to see it for myself. I was not disappointed. 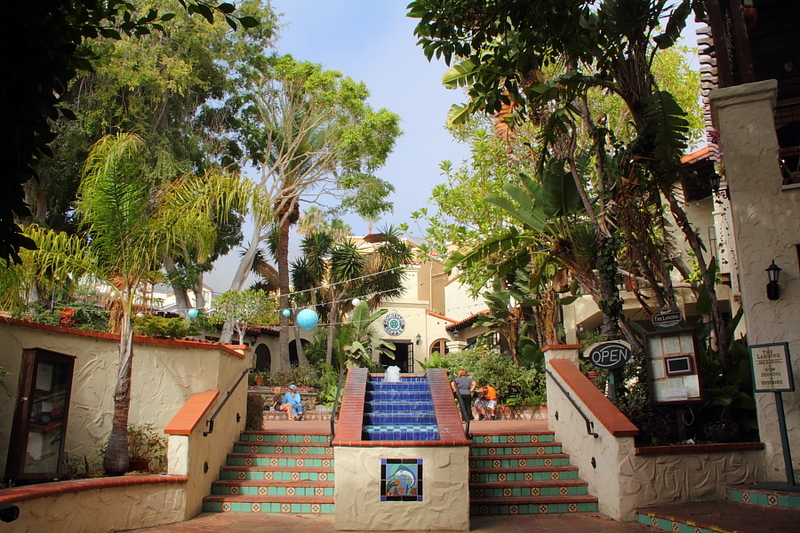 You don't need to make any kind of reservations... they have tours throughout the day for $10 per person. 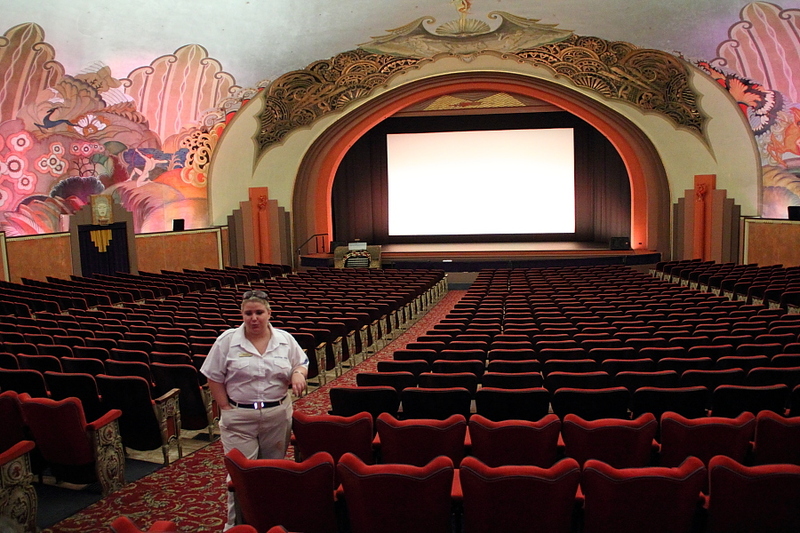 The lower two thirds of the casino is a theatre. In the evenings, they still show films here. 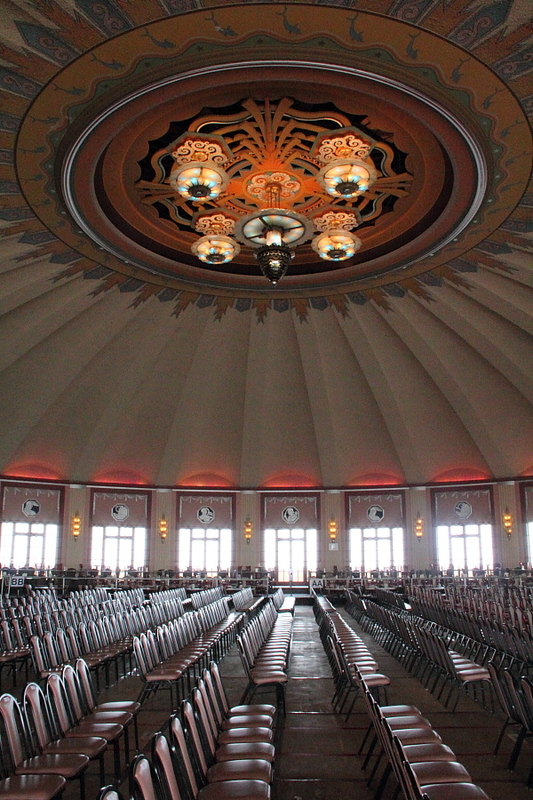 The upper third of the building is a large ballroom, with a huge wooden dance floor and a large stage. It makes an excellent venue for concerts, wedding receptions, and proms. When we visited, it was set up for a jazz concert... with the beautiful hardwood floors covered, and seating in place. 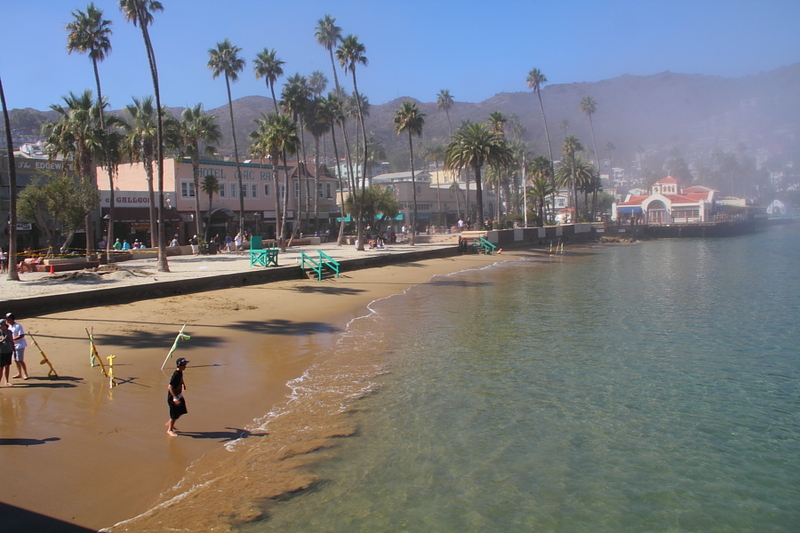 There is also a small beach at Avalon, and it's a great spot to dip your toes in the water or to let your children play for a while.. Here's a funny photo I couldn't resist taking! 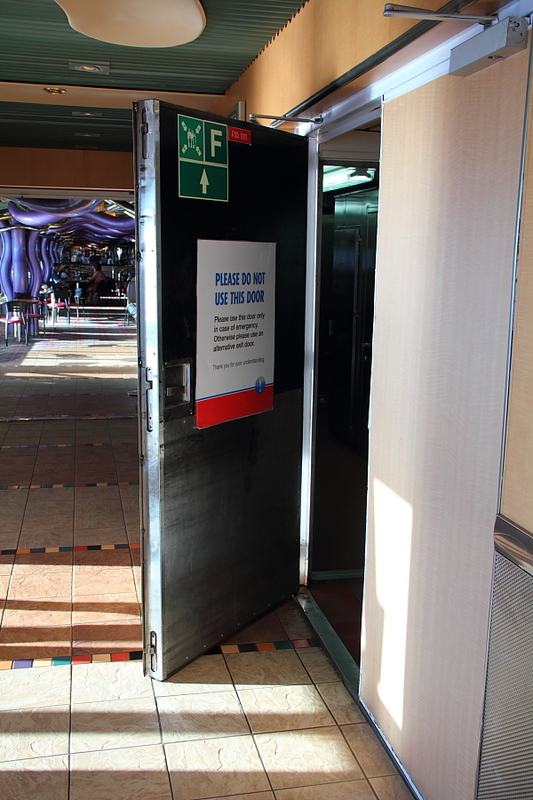 I laughed when I read the sign on the inside of this door that was propped open on Lido deck. 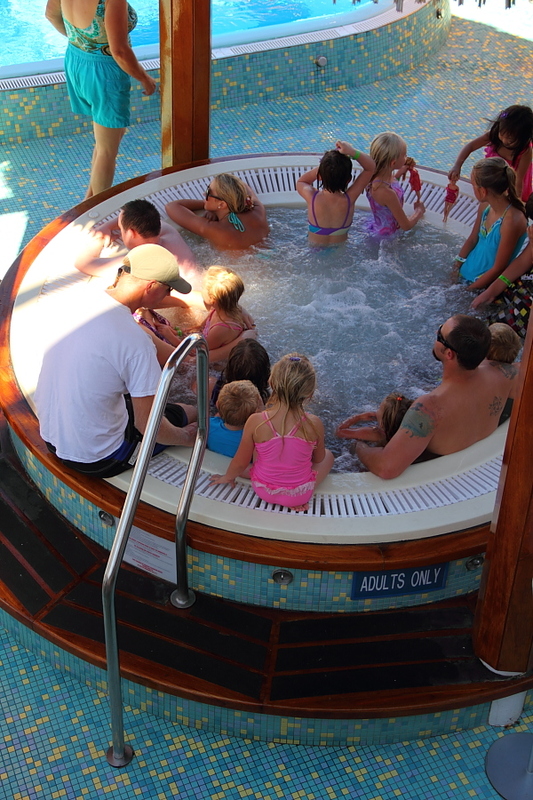 Along the same lines, I couldn't resist snapping this photo of the "adults only" whirlpool on the Lido deck, which was filled with kids! What you can't see is that just off to the right, outside the view of the photo, was a large sign explaining that it was OK for all ages to use this whirlpool... because Carnival was doing maintenance to the other nearby whirlpool. If you're in a full-time relationship with your laptop computer or iPad... be sure to bring it along! There's wi-fi available throughout the ship, even in your cabin... and on the Carnival Inspiration you can even buy an unlimited Internet access plan. Take a look at this detailed set of Carnival Inspiration deck plans. If your color printer can handle 11x17" paper, print these deck plans out at 11x17" and take them with you on your cruise. They are far more detailed than the printed deck plans they hand out on the ship. Or simply save the deck plans to your iPad or laptop computer and bring it with you on the ship. The cruises are longer, and they visit more interesting destinations. The safe in your closet opens and closes using a 4-digit combination of your choice, rather than with a magnetic card. There's a small refrigerator in your cabin. 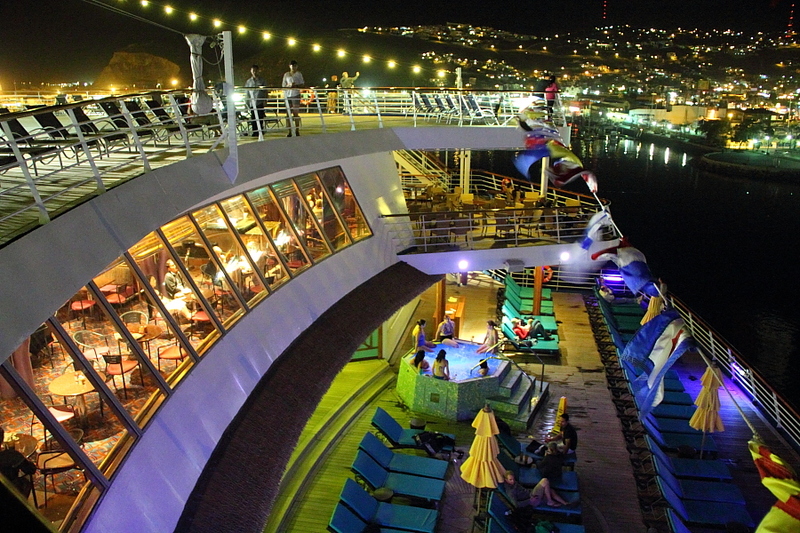 There are alternative dining venues such as a steakhouse, burrito bar, and on some ships an Italian restaurant. On the largest ships, there's a giant outdoor big screen by the pool... where they show concerts, sports, and movies. The cabins are slightly larger on the newer ships. For example, there's no room for a couch on most Fantasy-class cabins. There's more space around the bathroom sink for storing your personal grooming items. The Serenity areas are larger, and feature round day beds large enough for two people to snuggle together. The newest ships (such as the Magic and the Breeze) have two electrical outlets at the desk. Most Carnival ships just have one.